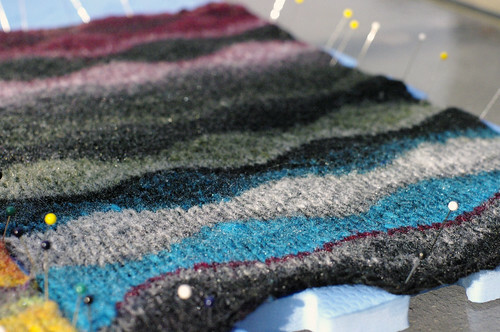 I know knitters everywhere already know that this is gospel truth: Blocking is MAGIC. Perhaps most astonishing when blocking lace knitting, it’s still shockingly effective in every other gauge for making a garment/accessory/knitted item look and drape and feel its absolute best. 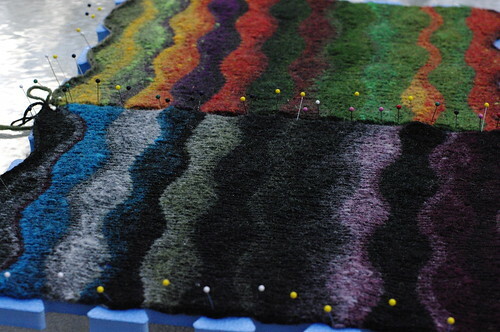 Because I so often procrastinate on blocking the stuff I knit, I’m always surprising myself when I manage a marathon blocking session and see the befores/afters. So despite the fact that all knitters know (or should know) the beauty of blocking, it’s something I need to remind myself of now and then. Is this blog-cheating, when I am showing you photos of things you’ve already seen the FO summary post for? Is blog-cheating a thing? Maybe. But you’re getting the pics anyway because come ON! LOOK AT HOW HOT THIS IS! Did you guys hear a primal knitter’s scream, though, a few hours ago? If so, that might have been me, discovering a bug-created hole in the grey section of that Lizard Ridge block, bottom of the photo, above. A HOLE. IN MY WOOL. Mama’s got some words for the exterminators tomorrow, OH YES. Mass bugicide is forthcoming to Chez Cadorette tout de suite. 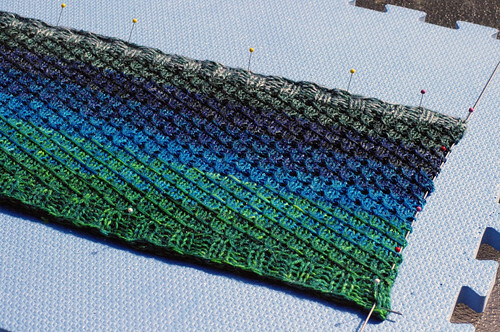 I am pretty sure I used every single pin in the house blocking three Lizard Ridge blocks, even with the use of blocking wires. Which, as an aside, I’d like to say are one of the best knitting tools I’ve ever purchased myself, second only perhaps to a high quality wooden umbrella swift. Anything you’ve been putting off blocking? Confess, and be shriven.